President Donald Trump ignited a new war of the words Tuesday with North Korean leader Kim Jong Un over the size of his purported "nuclear button." Trump tweeted, "North Korean Leader Kim Jong Un just stated that the 'Nuclear Button is on his desk at all times.' Will someone from his depleted and food starved regime please inform him that I too have a Nuclear Button, but it is a much bigger & more powerful one than his, and my Button works!" 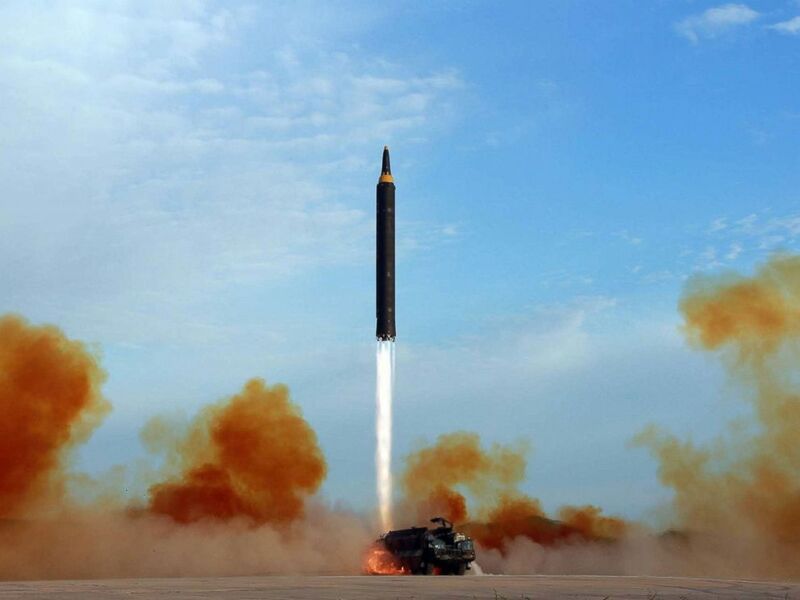 This undated photo distributed on Sept. 16, 2017, by the North Korean government shows what was said to be the test launch of an intermediate range Hwasong-12 in North Korea. Content of this image is as provided & cannot be independently verified. The president's attempt at one-upmanship came after the rogue leader said in a New Year's address, "the button for nuclear weapons is on my table," and that he could use it to launch an attack on the entire United States. But this latest battle of who has the biggest button, isn't grounded in reality: Trump does not actually have a nuclear button on his desk, reports The Associated Press. The nuclear "football" is carried by a rotating group of military officers everywhere the president goes.